The Full Drain Outlet (FDO) assembly, patent pending, for 2,500-gal tanks and larger, drains tanks without mechanically installed nozzles and can be utilized where heavy solids or salts may accumulate in the bottom. 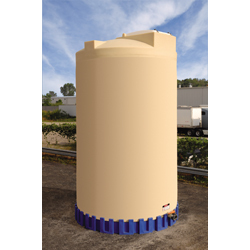 NSF has certified Assmann linear polyethylene tanks to NSF/ANSI Standard 61, while high-density crosslink resin tanks have NSF 61 certification. The company’s quality management system is ISO 9001:2015-certified.